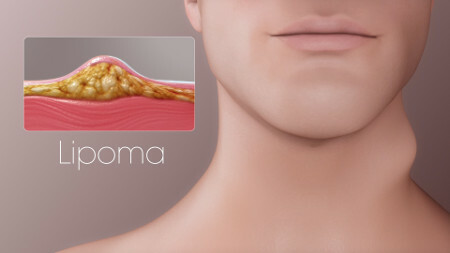 Lipoma is a benign neoplasm growing from adipose tissue, for which it received the name "wen." Such a problem is faced by one person out of a thousand, often without betraying her great importance. A benign tumor is not much different from normal adipose tissue and is a mature fat cells surrounded by a thin-walled fibrous capsule. This formation does not cause pain and is easily felt through the skin. Quite often, lipomas grow on the neck, abdomen, buttocks, upper back or arms, less often found on the gol or hand. There are easy to see, but they rarely pose a health hazard. A completely different situation with tumors in the walls of the organs or retroperitoneal space. Such a tumor can be found only during the examination, and the risk of harm to health is much higher. Regardless of the reason for the appearance of the wen when it is detected, it is worth to consult a doctor. Is a wen dangerous to health? Most subcutaneous lipomas are harmless, and their size is limited to 1-3 cm. But there are exceptions, when a lump of fat grows to several kilograms. Large accumulations of fat located in the walls of organs cause serious health problems. They crowd out healthy tissues, disrupt the innervation and blood supply in the body, leading to the emergence of comorbidities (intestinal obstruction, coronary insufficiency, etc.). Lipomatosis - the appearance of multiple neoplasms. The hump of Bisha - is a pathological accumulation of fat in the area of ​​the 7th cervical vertebra. Diffuse lipoma of the neck, which occurs when multiple symmetric lipomatosis. In advanced cases, the growth of tumors leads to compression of the cervical nerves, blood vessels, respiratory tract. This can contribute to serious consequences for the human body. Treelike lipoma formed in the joints and having a branchy shape. Ossified lipoma with formation of bone tissue foci inside. In addition, in rare cases, a benign tumor can degenerate into a malignant tumor, especially when it comes to wens in the retroperitoneal space. How to remove the wen? Since the lipoma consists not only of fat, but also of the fibrous membrane surrounding it, in order to cure it is necessary to get rid of both components. It is easiest to remove the wen surgically, but occasionally doctors confine themselves to steroid injections to prevent the growth of adipose tissue. Despite the potential risks, the removal of fatty tumors in children under 5 years of age is not carried out. Liposuction allows you to empty the fat pouch, but leaves the fibrous capsule, so there is a risk of recurrence of the problem. This method is often used to treat widow's hump. Endoscopy is used when removing small wen (2 cm). But Japanese doctors were able to introduce submucosa dessection techniques in the fight against masses up to 5 cm in diameter. With the help of surgery, it is possible to remove a lipoma of any size. To eliminate subcutaneous neoplasms, a small operation is sufficient under general anesthesia. The doctor anesthetizes the site of the procedure, cuts the skin, removes the wen, and then sews up the wound. When removing intraorgan lipomas, the intervention is performed under general anesthesia. Hardware methods, including laser, radio wave treatment or cryodestruction are applicable when removing small subcutaneous neoplasms. Experienced doctors of the Plastic and Cosmetic Surgery Center in Poltava will quickly relieve you of the problem with the most efficient and painless method.